Named for one of the industry's most revered personalities, the Les Paul Award was created in 1991 to honor individuals or institutions that have set the highest standards of excellence in the creative application of recording technology. The award is sponsored by the Les Paul Foundation. The term “renaissance man” is thrown around fairly indiscriminately these days (along with the word “awesome”). 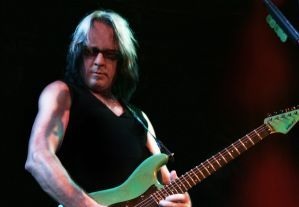 But Todd Rundgren truly is a renaissance man—a singer, songwriter, composer, multi-instrumentalist, producer, engineer, video artist, tech pioneer and visionary. The Philly native first opened eyes nationally when he fronted the group rock band the Nazz in the late ’60s, but it wasn’t until he started making solo albums a couple of years later that he earned his first hit, “Hello, It’s Me” (which he originally had cut with the Nazz) on his ambitious 1972 double-album, Something/Anything. That record was also notable because on three of the four sides, Todd played all the instruments. Since then, he's recorded albums in every conceivable way — with bands (Utopia is his most famous), without bands, layering instruments one at a time, live in the studio with no overdubs, live onstage; you name it. He’s cut note-for-note replicas of famous pop songs; laid down convoluted guitar-dominated prog-rock tracks; made an album entirely out of treated vocals; hit the charts with catchy, radio-friendly ballads; recorded interactive albums; and even made one with bossa-nova versions of some of his best-known tunes. He’s made albums in multi-million dollar studios, in his own recording spaces and even on laptop. He has constantly experimented with both tools and techniques, which has allowed him to continually evolve as an artist. Todd also has an extremely impressive career behind the board. By the time he left the Nazz in 1969, he had learned so much about recording and production that he became an in-demand engineer and producer. The list of high-profile artists he’s worked with is staggering, and includes The Band, Jesse Winchester, Badfinger, Grand Funk Railroad, the New York Dolls, Hall & Oates, Meat Loaf, Patti Smith, the Tubes, Psychedelic Furs, XTC, Cheap Trick, Bad Religion and the Flaming Lips, to name just a few. How he’s had time to cut two dozen solo albums and another ten or so with Utopia is anybody’s guess. He is famous for embracing new technologies as they come onto the market, and as a musician who can play so many different instruments, he has always kept his eyes and ears open to new developments in that area, too. Always creatively restless and apparently indefatigable, Todd has continued to do vital and compelling work, whether in collaboration with the Dutch Metropole Orchestra in Amsterdam last year or cutting his latest solo album, State, on an Apple laptop using Reason software. He’s always pressing forward, in search of the new, while never completely abandoning his past, as his occasional outings with Utopia and his ongoing commitment to Ringo Starr’s All-Star Band show.